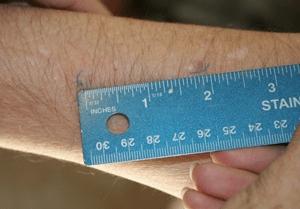 The dog bite injury photos Dr. Polsky maintains of injuries sustained by dog bite victims is a unique collection. Privacy issues prohibit the publication and distribution of most of the photos in this collection. Alternatively, an online source for dog bite photos can be found at photobucket.com. Reconstruction of a dog bite incident frequently becomes necessary in dog bite litigation and reasonably good photos of the physical features of the alleged bite injuries inflicted to the plaintiff can be helpful for this purpose. 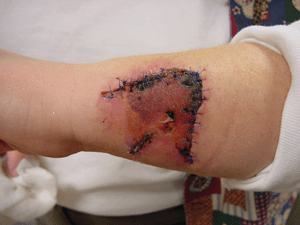 Photos of reasonable quality will usually show the distinctive physical features of wounds to people caused by dog bites. Dog bite photographs are also helpful in distinguishing a dog bite injury from injury caused by some other means. Bites inflicted to the body of a human typically have certain physical characteristics. 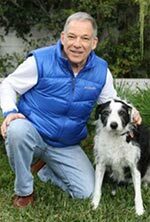 Dr. Polsky has no expertise in the medical treatment of dog bite wounds. 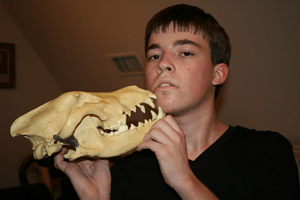 However, he has expertise in recognizing the physical features of a dog bite injury, and in reconstructing the context in which dog bite allegedly happened. and tear, and the teeth responsible for producing punctures and lacerations. The nature and physical appearance of a dog bite wound inflicted to a human obviously depends on the size and breed of the dog, and the condition of the dog’s teeth. In many instances, all the teeth of the dog are not used. Frequently, only injury resulting from infliction of the canine teeth can be seen. To the right is an illustration of a fatal dog attack inflicted to the neck of the victim by the canine teeth of a mastiff type dog. Dog bite Injury usually involves a combination of biting, crushing and tearing that often result in a characteristic lacerations and avulsions of skin and soft tissue. 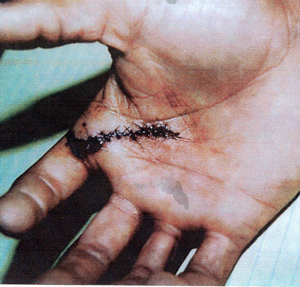 Blunt injury injury can occur in the absence of any obvious external lacerations or punctures. Fractures may happen. 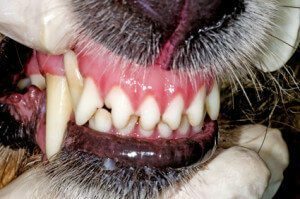 A dog bite injury may consist of the so-called “hole-and-tear combination” In which the canine teeth anchor the victim and the other teeth bite, sheer, and tear the flesh. 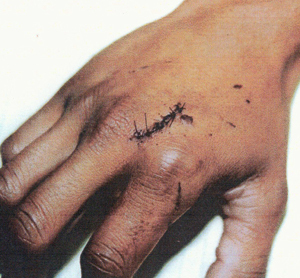 Puncture wounds on the victim may also occur bilaterally, as shown below. In some instances questions arise as to whether injury sustained by a victim was actually the result of a dog bite. An example of a dog bite injury that was supposedly inflicted by a Great dane to the knee of the plaintiff is shown below on the left. To the right is another example of a questionable dog bite injury that arose in a different lawsuit. 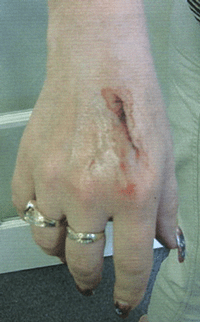 In addition to the physical characteristics of a dog bite, other factors may be considered in determining whether the plaintiff was bitten by a dog; namely whether the dog in question possessed the temperament to bite a person, and the physical features of locale where the incident took place (e.g. height of a fence or space between wrought iron bars). 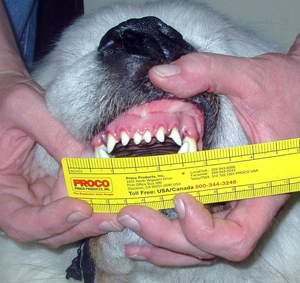 In some cases, it becomes important to determine which of several dogs inflicted the dog bite injury, and in some instances one approach would be to take measurements of the distance between the dog’s canine teeth and compare this with the the distance between the puncture wounds on the victim’s body. The photographs below Illustrate this approach. In some dog bite cases, measurement of the maximum standing height a dog could reach might be useful. This might be needed, for example, if there is conflicting testimony about the position of a person if the bite injury was infliced to the face. Was the person standing or bending over the dog? Was the dog tall enough to reach the face of the victim if the victim was standing? The photograph to the left shows measurement of a dog’s maximum standing height. Another approach that could potentially prove fruitful in the forensic analysis of dog bites for reconstruction purposes, involves using the skull of a dog and positioning the skull against the body part that was bitten. Using this method one can get a good sense of how the dog must have been positioned the moment the incident occurred. For example, in one recent case the defendant’s testimony differed from the plaintiff’s in terms of how the dog was positioned when the bite was inflicted to the plaintiff’s face (sitting vs. lying). In order to determine which version was correct, one aligns the skull against the person’s body, as shown in the photograph to the right. This approximates the position the dog must have been in when the bite was inflicted.